Browning's Superlight Spinning Reel is perfect for taking panfish and crappie with light tackle. The Superlight Spinning Reel features a lightweight but tough graphite frame, a smooth two-piece aluminum spool with coated lip and a reliable five-bearing system that includesPowerLock instant anti-reverse. Gear ratio: 5.2:1. "AWESOME REEL!!!!! will even bring in bigger fish with out blinking. BUT....if your hands are bigger(like mine) the bail will wack your knuckles from time to time. Other than that would NOT trade it for anything." "THIS IS AN EXCELLENT ULTRALITE REEL AND I COULDN'T BE MORE PLEASED.I USE THIS FOR TROUT IN VERY HARD TO FISH STREAMS AND IT IS A JOY TO BEHOLD.FOR THOSE REVIEWERS THAT HAVE A PROBLEM WITH THE BAIL HITTING THEIR KNUCKLES"
"i use this reel for trout and small mouth works great. i have never had a problem from this reel." 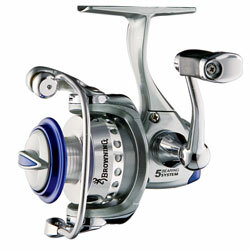 "I own 2 of these reels and like them. They cast exceptionally well. Line comes off reel easily and also spools up good when you reel in the line. I have a 500 and a 750."